Olena out of a daughter of Peppy San Badger. 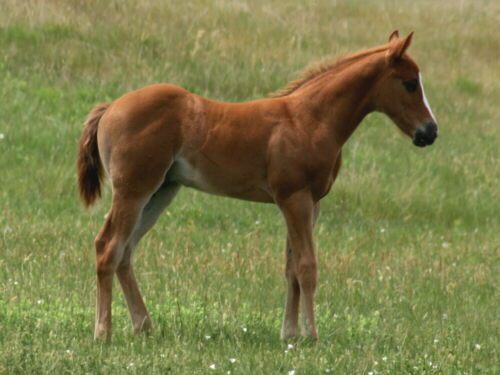 Pictured here at age 17 in pasture condition. 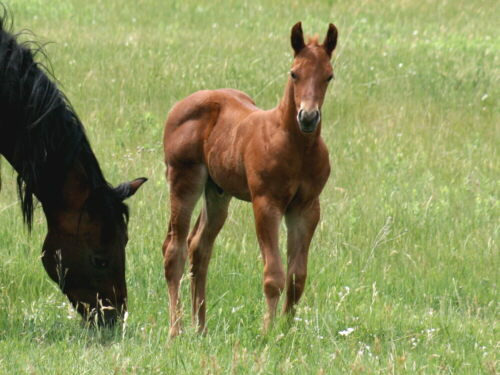 We are always looking forward to Lacy's foals. 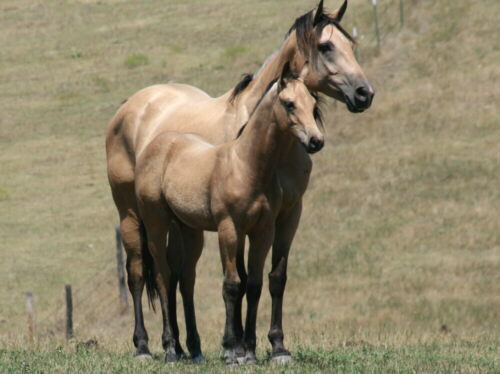 Her foals are always pretty build with great muscleing and big hips. 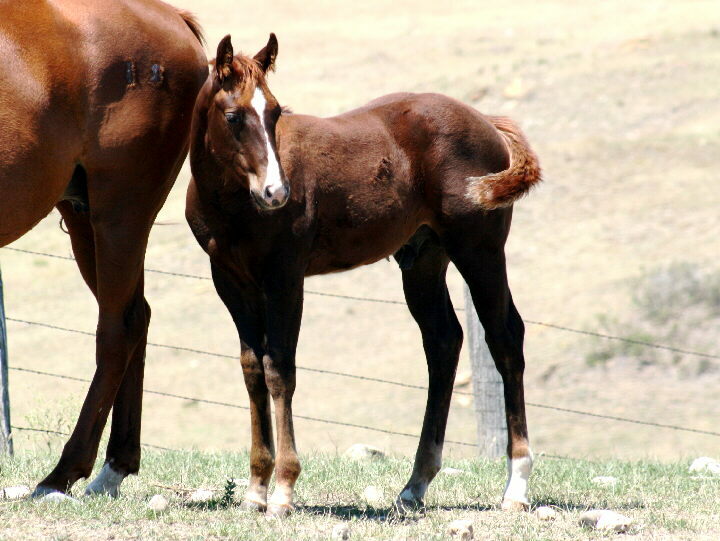 This little stud colt with the beautiful head likes mud - obviously! This is the second year we bred our best broodmare "Tempesta" to our cutting bred stud Dualin With Cows. Her thickness and stamina paired with his cowsense and quickness gave us a beautiful, heavy muscled filly in 2011, and her 2012 filly sure looks like a halter prospect with a cow working future too! Feedbacks of this fillies full brother (2009) and full sister (2008) start to come in - the only thing these horses can not do seem to be to make a pot of coffee. Friendly, mellow, quick, cowy, easy going - all someone could ask for in a horse. 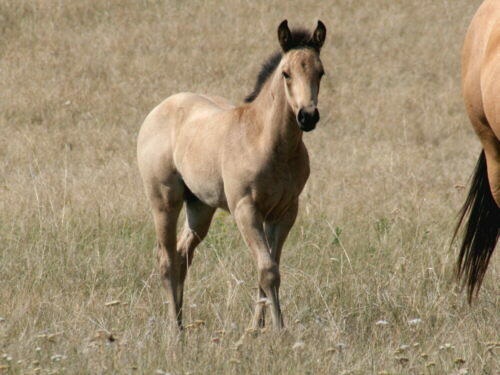 This filly has the big hip and thick musceling we are used to see in Jeep's offspring. 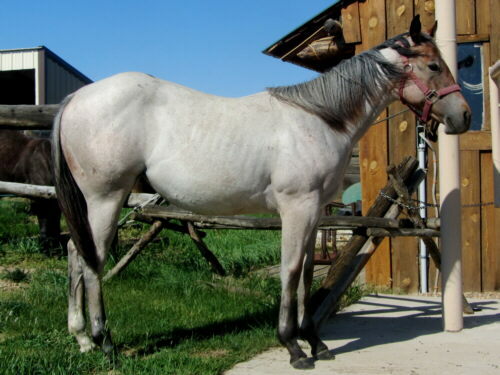 Roxy is a very nice put together bay roan filly. 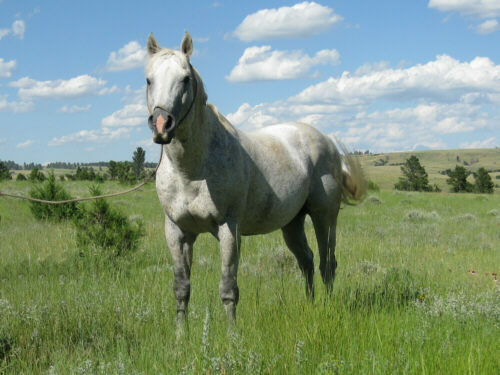 She is by our herd sire Dualin With Cows, a grandson of Dual Pep, and Smokes Dinahlee aka "Roxanne", a mare we used at the ranch before she joined the broodmare band. 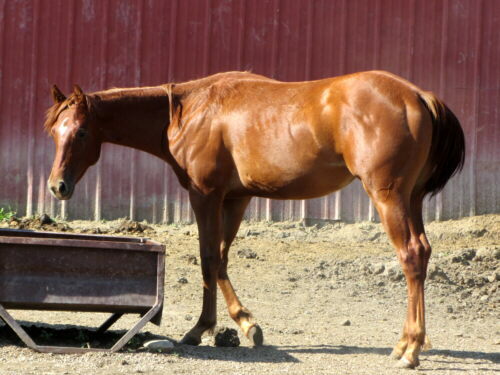 Dualin is known for easy trainable, mellow yet quick offspring, and the mare puts a lot of muscleing in her babies. Roxy is a beauty with charisma, she is heavy muscled and has a fine head. She is halter trained with a friendly, people loving disposition. Located in North East Wyoming. 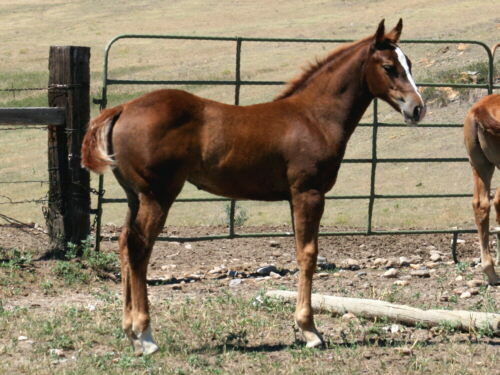 Her 2012 filly is beautifully colored, solid, no markings. 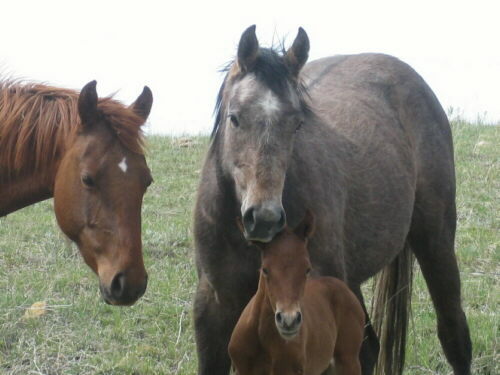 Her 2012 filly was born beginning of June, as all of her babies with very little white on her. 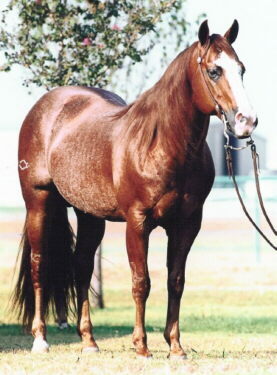 Her 2006 stud colt was kept as a breeding stud. 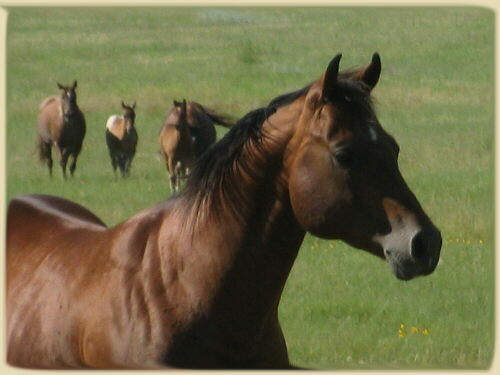 Also her 2007 filly stayed at the ranch for breeding. This filly is as well put together as her siblings, she will be a looker with brain. 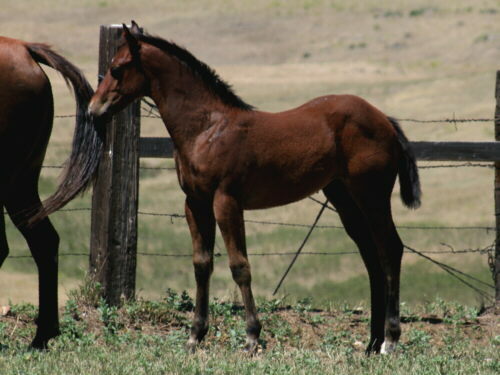 Well muscled and straight legged filly by parents with easy going dispositions. 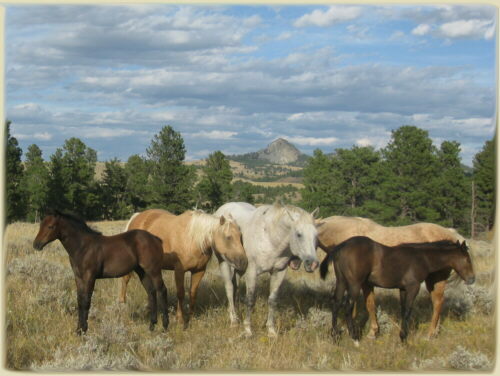 Prospect for reined cow horse events, ranch & trail. 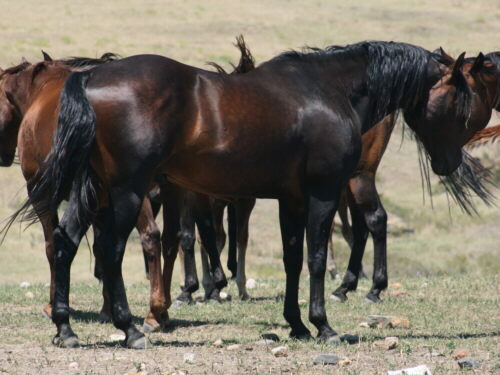 Sadly, this filly was a victim of winterstorm "Atlas", that hit Western South Dakota and North East Wyoming on October 4th, 2013, killing 64,000 cows and hundreds of horses in it's path. 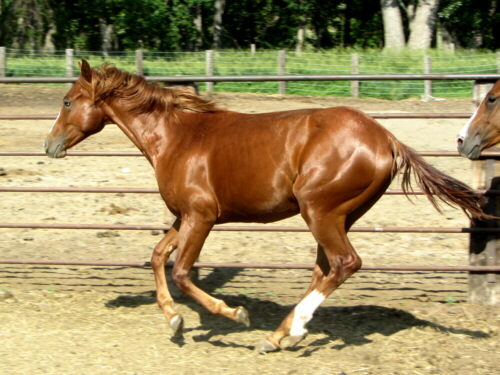 "Delta" was born in May and has a great color and conformation, straight legs and heavy muscleing. She is bred to work cows with Smart Little Lena, Peppy San Badger, and Frosty Feature right on her papers. She should mature at least 15.1 hands. She is halter broke, very people loving and a quick learner. Delta is located in North East Wyoming. This stud colt is no exception, born late June he is a little muscle packet without a white hair on him. This colt has "cutting" written all over his pedigree. Paddys Irish Whiskey, Doc O Dynamit, Doc's Hickory, Quichina Bar - these are names known in the industry. He has a lot of hip and a well set neck.
. His pedigree speaks for himself, he produces outstandig cowy ranch and arena horses. 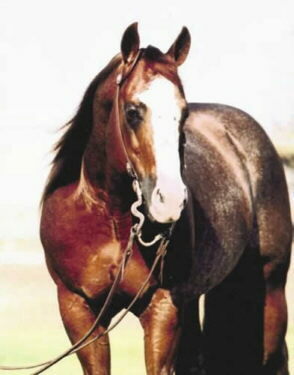 This will be his last foal crop because he has, sadly, passed on in fall 2011. The picture speaks for itself, though - really well muscled filly with chrome. Put together a grandson of Smart Little Lena and Peppy San Badger with a mare out of our best broodmare, Peppy San and Baron Bell bred, and an own son of Paddys Irish Whiskey - and expect a cow eating prospect. 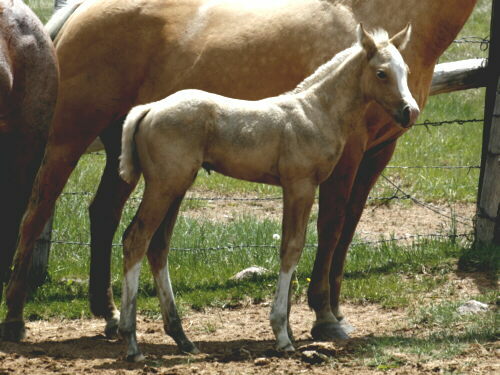 This years foal is a beautiful sorrel filly with two partial blue eyes. 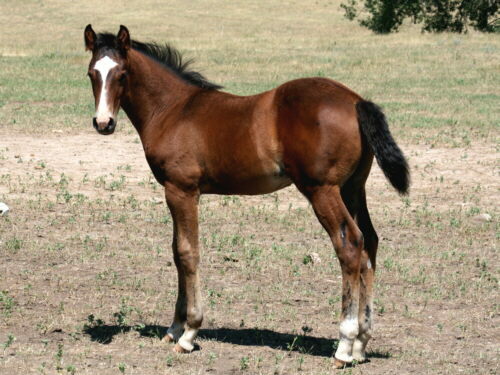 My personal favorite: Smart Doc Doubles stud colt. 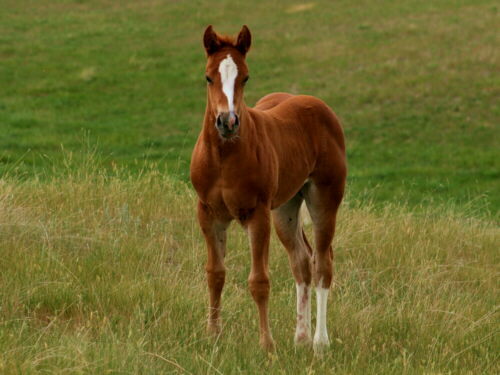 This beautiful put together colt is double bred Smart Little Lena, with all the background to work a cow. 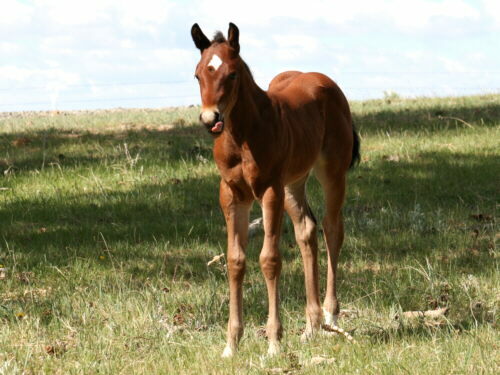 This young mare had two outstanding foals for us in the past years, and we are impressed by what she produced with our Smart Chic Olena stud Chics Texas Twister. 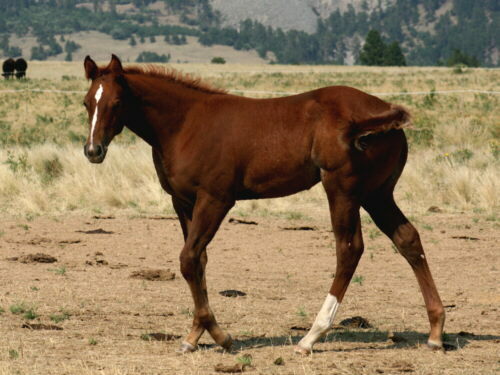 This is a short backed, heavy muscled stud colt with lots of charisma. Not much to add to this looks and breeding. 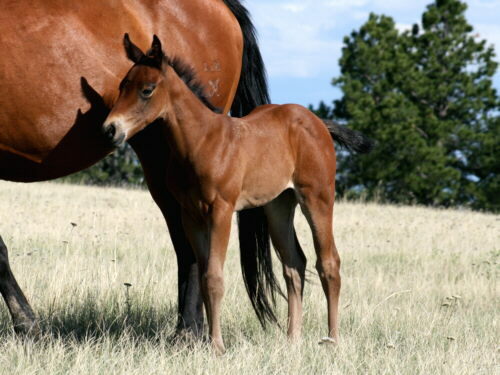 Coming from the best working cow and cutting lines in the industry; with Smart Little Lena, Peppy San Badger, Doc's Hickory, and Doc's Juniper right on her papers, her 2011 filly looks exactly as her full brothers and sisters. This 2012 foal will be the last with this magical cross. It happend just days before our coming 2year old stud colts saw the vet to become geldings - Featuring Hickory fell in love with his kindergarden friend Windy Dual Gun and the result was an outstanding stud colt born this year. 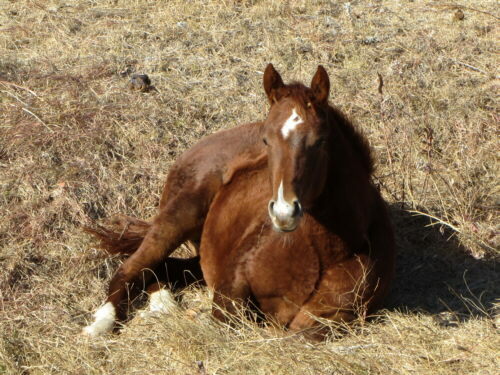 Even though both parents are registered Quarter Horses this litte fellow will sell grade due to very high fees for a late registration with AQHA (DNA for both parents, late filed stud report and usual registration fees would add up to about $250 for the registration at this time).